We are excited to announce the public preview of the new Premium tier for Azure Redis Cache. This offering is an Enterprise-ready tier designed for maximum scale and enterprise integration. As with Basic or Standard tier, Premium tier is also a dedicated and managed offering from Microsoft. It includes all the Standard-tier features and more, such as better performance over Standard-tier Caches, bigger workloads, data persistence, and enhanced security. Following is an overview of the available features today. Caches in Premium tier are deployed on hardware which have faster processors and gives better performance as compared to the Basic or Standard Tier. Premium tier Caches have higher throughput and lower latencies. Throughput for the same sized Cache is higher in Premium as compared to Standard tier. Eg. For a 53 GB Cache, throughput of P4(Premium) is 250K RPS as compared to 150K for C6. Please see this FAQ for more information on the performance characteristics of Premium tier. Premium tier allows you to persist data stored in Redis to an Azure Storage account. In Basic/Standard tier all the data is stored only in memory. In case of underlying infrastructure issues there can be potential data loss. We recommend using Redis data persistence feature in the Premium tier to increase resiliency against data loss. In Azure Redis Cache, We support both RDP Snapshot and AOF (coming soon) as described in the Redis persistence documentation. If you want to create Caches of greater than 53GB or want to shard (split) data across multiple Redis nodes, then you can use Redis Cluster. Azure Redis offers Redis Cluster master-slave model where each shard (Redis node) in the cluster is a master/ slave pair and the Azure Redis Cache service manages replication and failover between these nodes in the cluster. Redis clustering gives you maximum scale and throughout. Throughput increases linearly as you increase the number of shards (nodes) in the cluster. Eg. If you create a P4 cluster of 10 shards, then the available throughput can be as high as 250K *10 = 2.5Million RPS. Please see this FAQ for more information on the performance characteristics of Premium tier. Caches created in Basic or Standard tier are accessible from the public internet. Access to the Cache is restricted based on the access key. In Premium tier you can further ensure that only clients within a specified network can access the Cache. 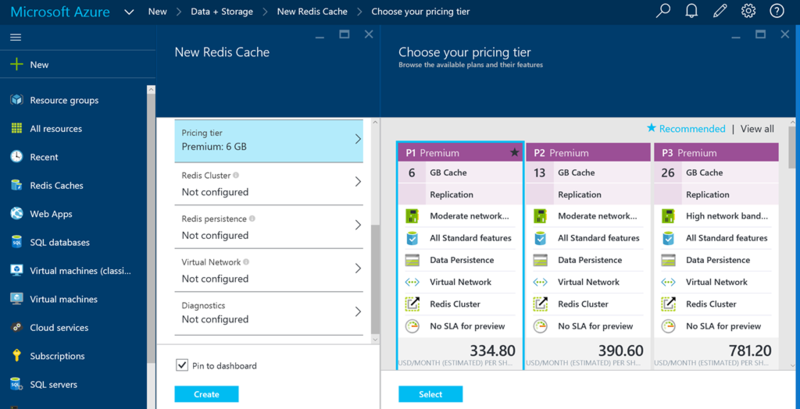 You can deploy Redis Cache in a Azure Virtual Network (VNet). You can use all the features of VNet such as subnets, access control policies, and other features to further restrict access to Redis. Note: As part of a special promotion during the Premium-tier public preview, you’ll receive Standard-tier pricing using Standard-tier meters. There is no SLA for Premium tier during the preview period. Please see the Redis Cache pricing page for more details. You can create Redis Caches in Premium tier using the Azure Preview portal or using ARM templates. Support for Azure command line tools will be coming soon. We are also releasing a preview of ASP.NET Redis Session and Output Cache providers to support Redis Cluster. This is a major update to existing providers since the key format has changed to support clustering. Please see more details on the changes in this release. Following are the relevant links for creating Redis Cache in Premium tier with various features. Today, we have released an initial set of features which should give you a good idea about the scenarios that would be possible. There are some more options which will be enabling soon so do keep an eye out on the blog and portal updates. Following are the limitations in the preview which will be removed soon. Persistence with other features eg. Redis Cluster with Persistence. Configure RDB options in Redis Persistence. Enable AOF mode in Redis persistence. Scaling the number of shards (Redis nodes) in a cluster. The Premium tier is an Enterprise ready tier designed for maximum scale and enterprise integration. We welcome you to try this offering and give us feedback on how can we make it better. As you try this new offering, if you have any questions please use the Azure Redis Cache Forum and Azure Redis Cache User voice for any suggestions for new features. You can also contact us about any limitations or feedback about the Premium tier.